The Cosatto Hubbub 123 (5 point plus) ISOfix Car Seat is a burly bodyguard. This 3 stage soldier’s mission is to be of long service to your little pudding; changing from dinky throne to big-kid booster seat. The Cosatto Hubbub features the brand new Cosatto Anti-Escape System to ensure that your cadet is as safe. Why should I choose the Cosatto Hubbub 123 (5 point plus) ISOfix Car Seat? 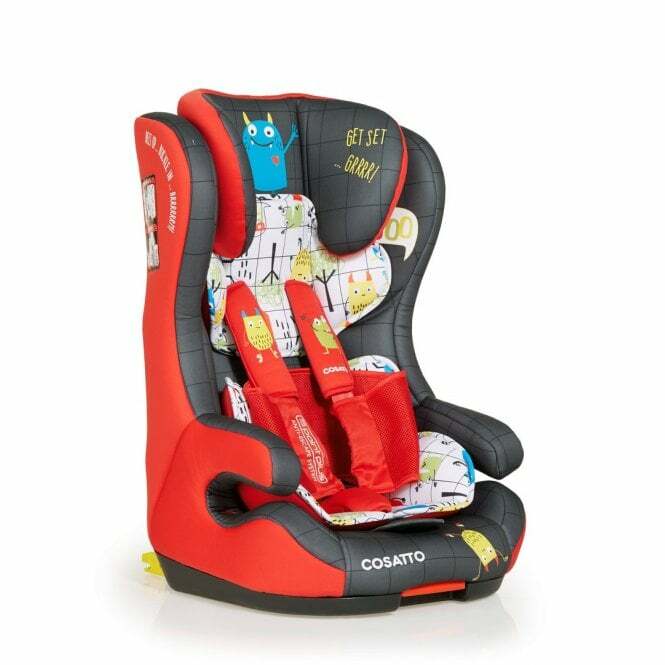 This fun and wacky designed Group 1-2-3 Car Seat by Cosatto is suitable from 9kg to 36kg (approx. 9 months to 12 years). In Group 1 mode, the Hubbub can be used in your vehicle using either the car’s 3-point seat belt or ISOfix if the anchors have been fitted by the vehicle manufacturer. Once ready to move into Group 2 and 3 modes, the Cosatto Hubbub is to be secured using only the car’s 3-point seat belt. This forward-facing Cosatto Hubbub 123 (5 point plus) ISOfixCar Seat has a headrest with 6 different positions to choose from, perfect for your growing beanstalks and offering you longevity. It features a 5-point safety harness, luxury plush armrests, and comfortable tummy and chest pads to protect the body from harness indentations. The harness can be opened with its quick release button. Handy features such as a top tether strap storage pocket and unique moulded harness hideaway (Groups 2 & 3) give the Cosatto Hubbub 123 that edge over competitive models. What’s more, the Hubbub comes with a 2-part, reversible seat liner that is easy to remove if Charlie has dropped strawberry ice-cream all over the place. The covers are machine washable. Offering your little warrior side impact protection, the Cosatto Hubbub 123 (5 point plus) ISOfix Car Seat is a great purchase for any toddler. What is the Cosatto Anti-Escape System? Research shows that more than 7 in 10 children manage to wriggle their way out of their car seat harness! This obviously increases the likelihood of serious injury if involved in a collision. The Cosatto Anti-Escape System has been designed, working alongside the makers of the original, award-winning ‘5 Point Plus’ harness system, to provide kiddies with a safer designed harness and in turn giving parents the peace of mind they need when travelling with infants. Do I get a warranty with the Cosatto Hubbub 123 (5 point plus) ISOfix Car Seat?